What do a coffee expert, dairy expert, economics professor, and finance professor have in common? Maybe not much, but in Lima, they all get together to practice their English with volunteer Jane. Jane is a retired nutritionist, so she knows the meaning and pronunciation of all those technical words professors at the La Molina Agrarian University want to know. They all love reading papers on such topics as climate change, genetically-modified crops, and food production. But not everyone speaks that language. Judi, a retired teacher, teaches conversational English classes to university students. She has had classes with up to 28 students. Most of them are in their early twenties, although she has teenagers and older ladies as well. With such different ages and backgrounds, it would generally be difficult to manage such a group, but Judi has no issues at all as she is experienced and, above all, students are eager to learn. At LMLC, students sign up voluntarily for these classes, so they come to class because they really want to learn English. 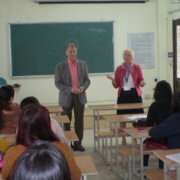 Jane, a volunteer serving in Peru, teaching conversational english to college professors and experts on al srots of topics. Volunteer Judi teaching english at one of her classes with students of varying ages. In one of Judi’s classes, a group of Korean exchange students joined in her class as they heard Judi’s class sing “We are the World.” The Korean students were taking Spanish lessons, so Judi’s class repaid their gesture by joining their class to sing a Spanish song. Here at LMLC, is not strange to see Koreans, Americans, and Peruvians singing together. Both Janie and Judi finish the day tired, but happy. Teaching conversational English may not sound like much to some, but Jane and Judi realize how important it is for low-income students who need English to study and find a job, and what a rewarding experience is to see their students try hard and enjoy their classes. Students and staff at LMLC are thankful for Janie and Judi, and Global Volunteers is thankful for them and all the volunteers who have given their money, time, and effort to help these students. Judi and her class singing with Korean exchange students.